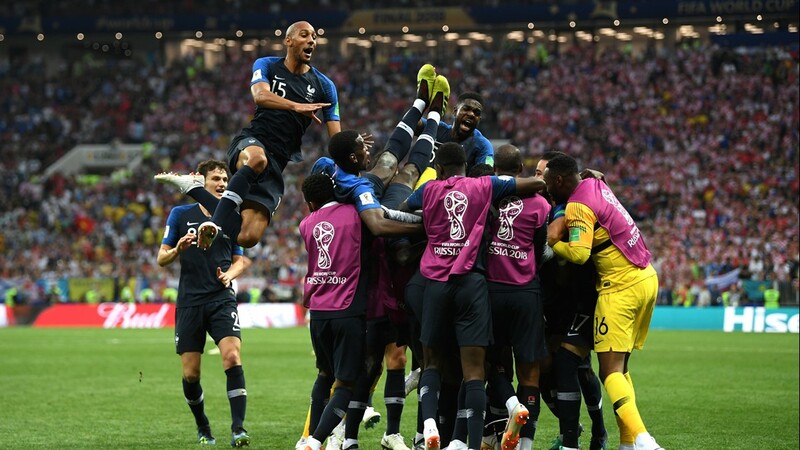 France players celebrate their victory following the 2018 FIFA World Cup Final between France and Croatia at Luzhniki Stadium on July 15, 2018 in Moscow, Russia. 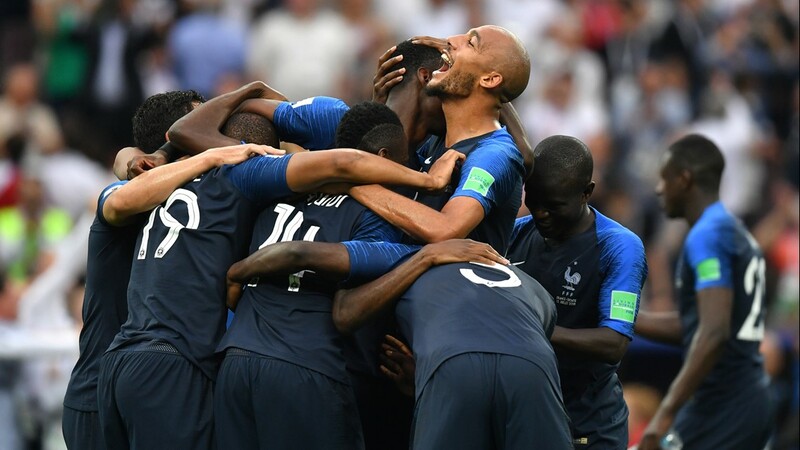 France players celebrate following their sides victory in the 2018 FIFA World Cup Final between France and Croatia at Luzhniki Stadium on July 15, 2018 in Moscow, Russia. 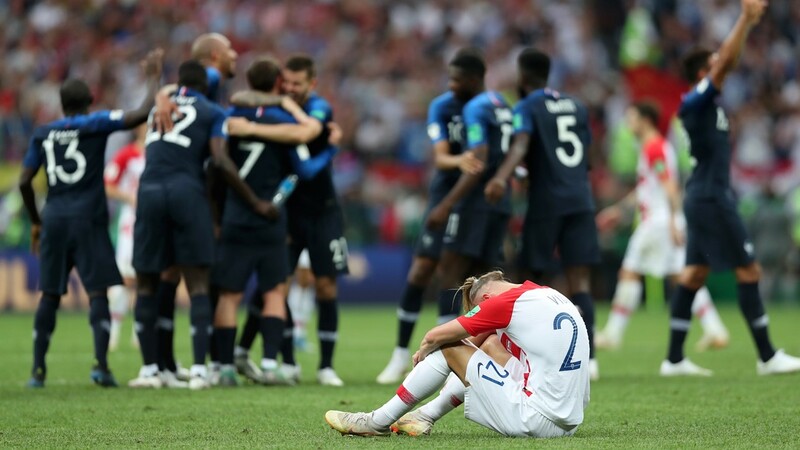 Domagoj Vida of Croatia looks dejected following his sides defeat in the 2018 FIFA World Cup Final between France and Croatia at Luzhniki Stadium on July 15, 2018 in Moscow, Russia. Luka Modric of Croatia looks on dejected during the 2018 FIFA World Cup Final between France and Croatia at Luzhniki Stadium on July 15, 2018 in Moscow, Russia. Paul Pogba of France celebrates after scoring his team's third goal during the 2018 FIFA World Cup Final between France and Croatia at Luzhniki Stadium on July 15, 2018 in Moscow, Russia. 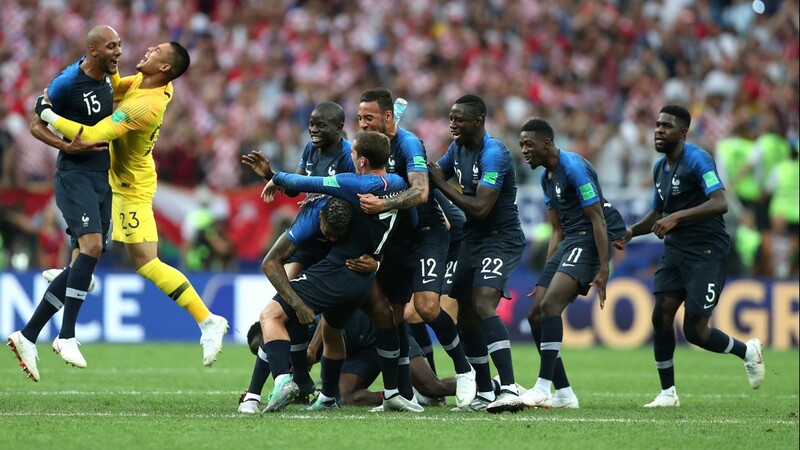 Hugo Lloris of France reacts following Mario Mandzukic of Croatia scoring his team's second goal during the 2018 FIFA World Cup Final between France and Croatia at Luzhniki Stadium on July 15, 2018 in Moscow, Russia. 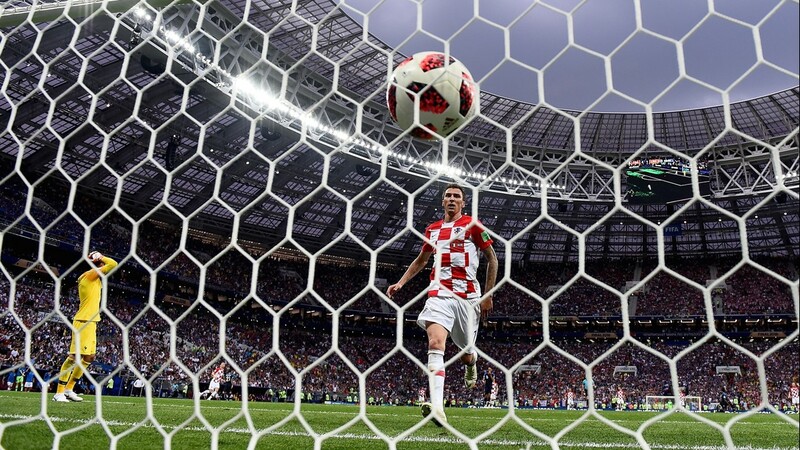 Mario Mandzukic of Croatia celebrates after scoring his team's second goal past Hugo Lloris of France during the 2018 FIFA World Cup Final between France and Croatia at Luzhniki Stadium on July 15, 2018 in Moscow, Russia. Kylian Mbappe of France celebrates with team mates after scoring his team's fourth goal during the 2018 FIFA World Cup Final between France and Croatia at Luzhniki Stadium on July 15, 2018 in Moscow, Russia. 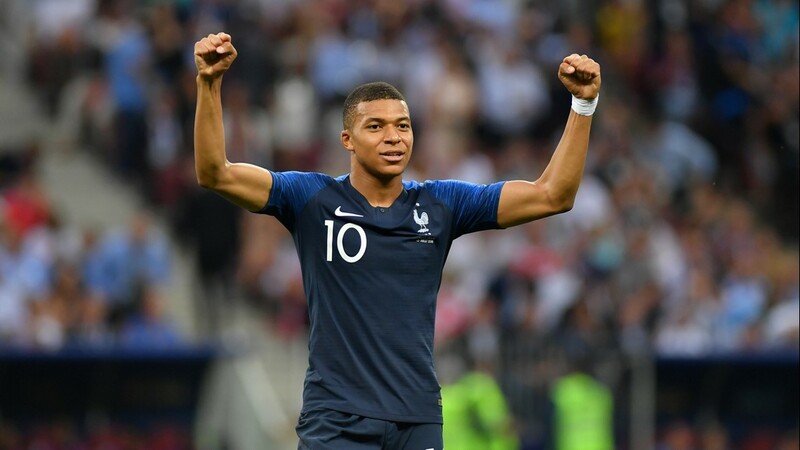 Kylian Mbappe of France celebrates after scoring his team's fourth goal during the 2018 FIFA World Cup Final between France and Croatia at Luzhniki Stadium on July 15, 2018 in Moscow, Russia. 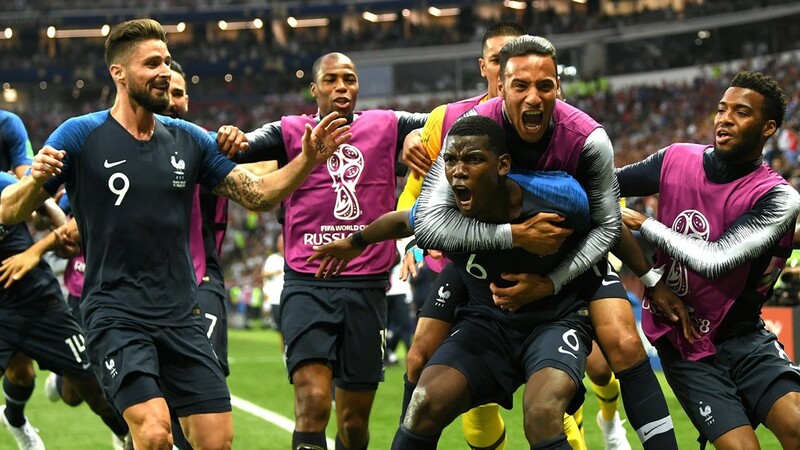 Paul Pogba of France celebrates with team mates after scoring his team's second goal during the 2018 FIFA World Cup Final between France and Croatia at Luzhniki Stadium on July 15, 2018 in Moscow, Russia. 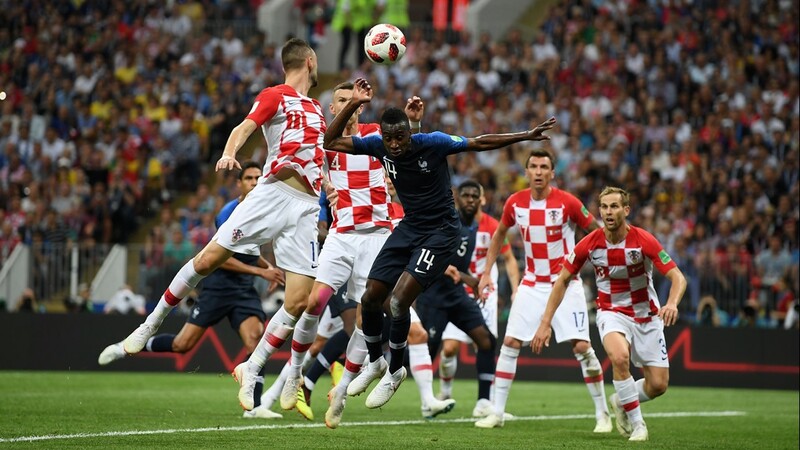 Raphael Varane of France controls the ball ahead of Ivan Perisic of Croatia during the 2018 FIFA World Cup Final between France and Croatia at Luzhniki Stadium on July 15, 2018 in Moscow, Russia. 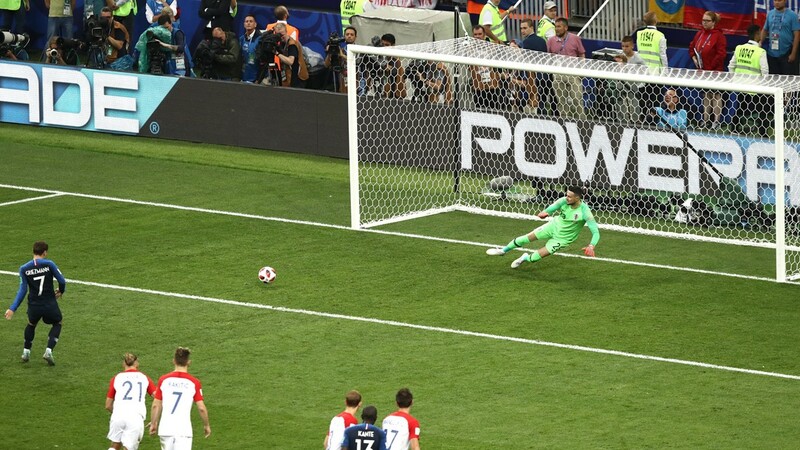 Antoine Griezmann of France scores past Danijel Subasic of Croatia his team's second goal from the penalty spot during the 2018 FIFA World Cup Final between France and Croatia at Luzhniki Stadium on July 15, 2018 in Moscow, Russia. A pitch invader is stopped by Dejan Lovren of Croatia during the 2018 FIFA World Cup Final between France and Croatia at Luzhniki Stadium on July 15, 2018 in Moscow, Russia. 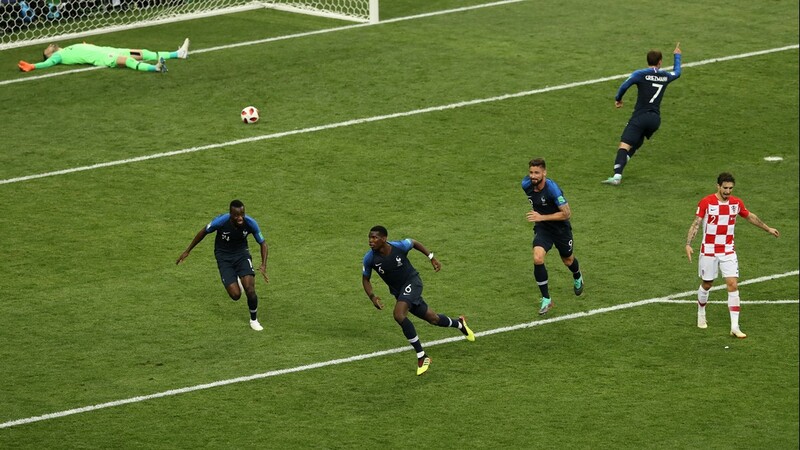 Pitch invadors run across the pitch during the 2018 FIFA World Cup Final between France and Croatia at Luzhniki Stadium on July 15, 2018 in Moscow, Russia. 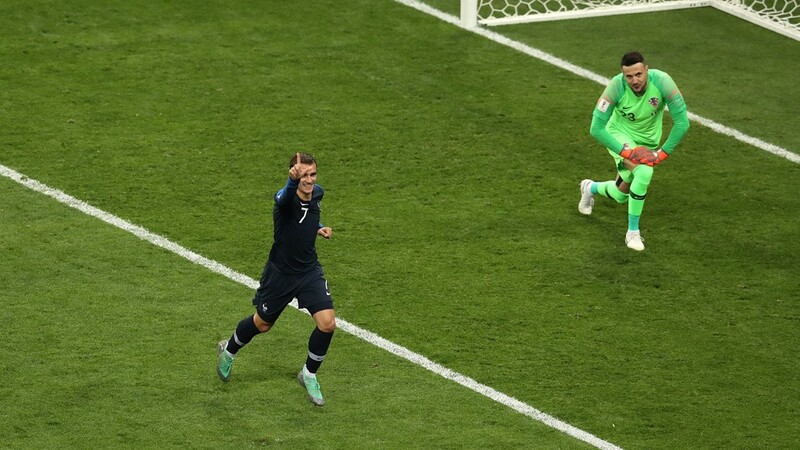 Antoine Griezmann of France celebrates after scoring a penalty for his team's second goal during the 2018 FIFA World Cup Final between France and Croatia at Luzhniki Stadium on July 15, 2018 in Moscow, Russia. 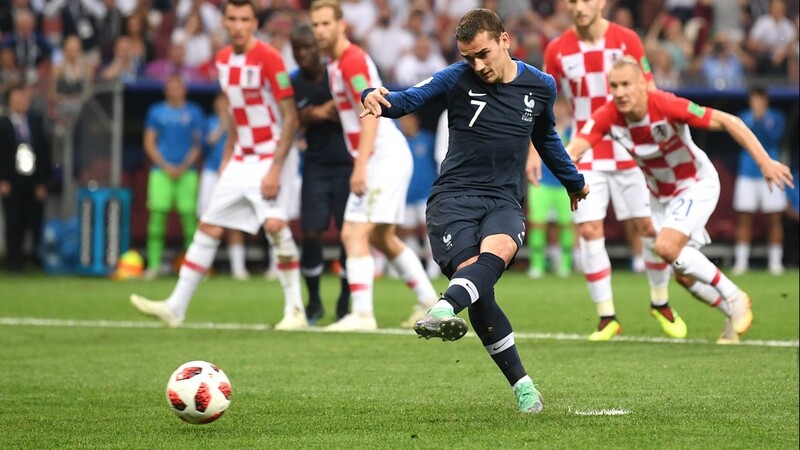 Antoine Griezmann of France scores his team's second goal from the penalty spot during the 2018 FIFA World Cup Final between France and Croatia at Luzhniki Stadium on July 15, 2018 in Moscow, Russia. 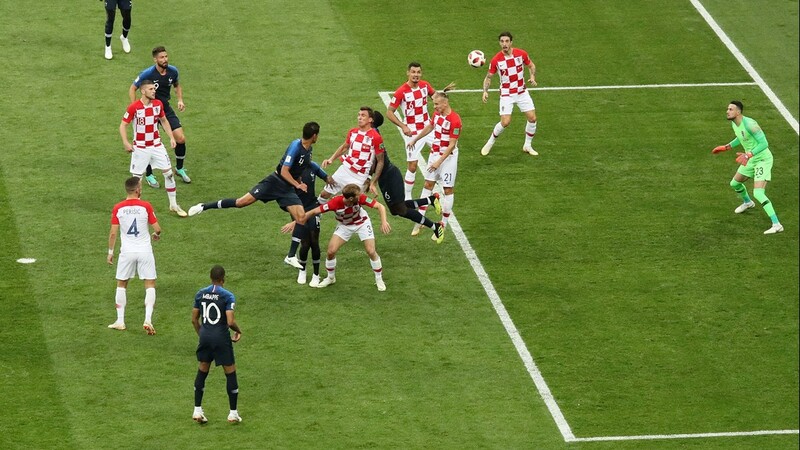 Ivan Perisic of Croatia handles the ball inside the penalty area, leading to a VAR review, and then a France penalty during the 2018 FIFA World Cup Final between France and Croatia at Luzhniki Stadium on July 15, 2018 in Moscow, Russia. 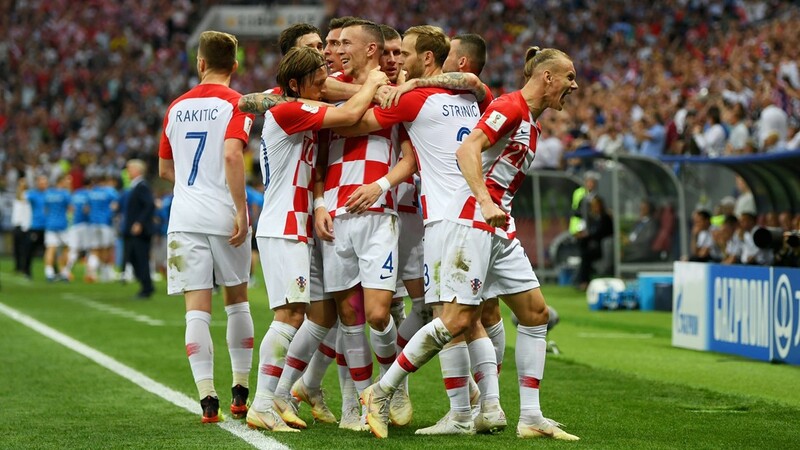 Ivan Perisic of Croatia celebrates with team mates after scoring his team's first goal during the 2018 FIFA World Cup Final between France and Croatia at Luzhniki Stadium on July 15, 2018 in Moscow, Russia. Ivan Perisic of Croatia celebrates with team mate Ante Rebic after scoring his team's first goal during the 2018 FIFA World Cup Final between France and Croatia at Luzhniki Stadium on July 15, 2018 in Moscow, Russia. 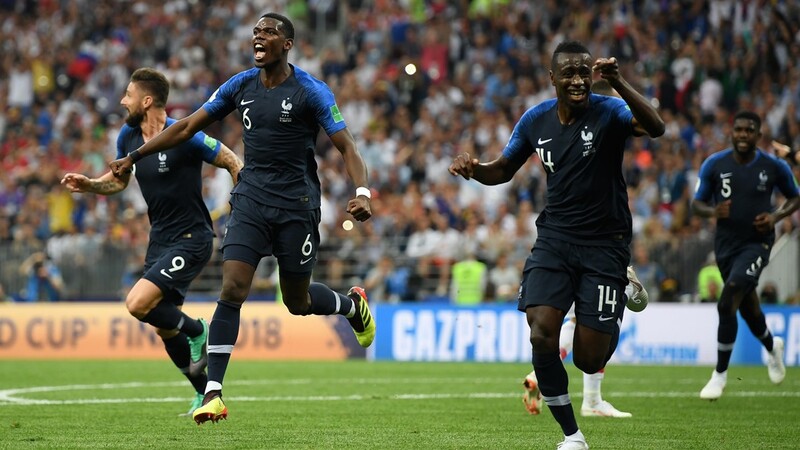 Paul Pogba and Blaise Matuidi of France celebrates after Mario Mandzukic of Croatia scores an own goal for France's first goal during the 2018 FIFA World Cup Final between France and Croatia at Luzhniki Stadium on July 15, 2018 in Moscow, Russia. 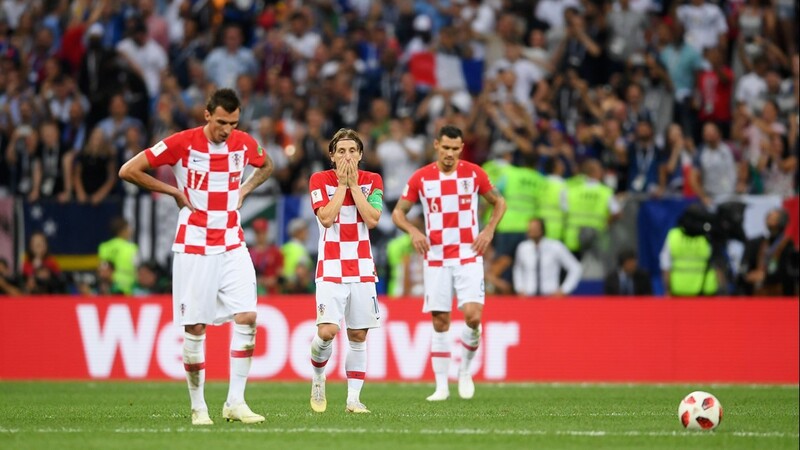 Mario Mandzukic of Croatia scores an own goal from Antoine Griezmann of France's free-kick, France's first goal during the 2018 FIFA World Cup Final between France and Croatia at Luzhniki Stadium on July 15, 2018 in Moscow, Russia. 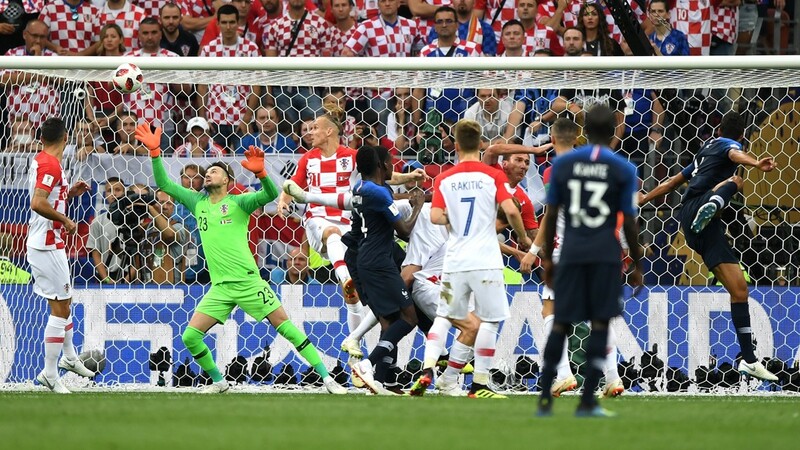 Mario Mandzukic of Croatia scores an own goal past team mate Danijel Subasic, France's first goal during the 2018 FIFA World Cup Final between France and Croatia at Luzhniki Stadium on July 15, 2018 in Moscow, Russia. 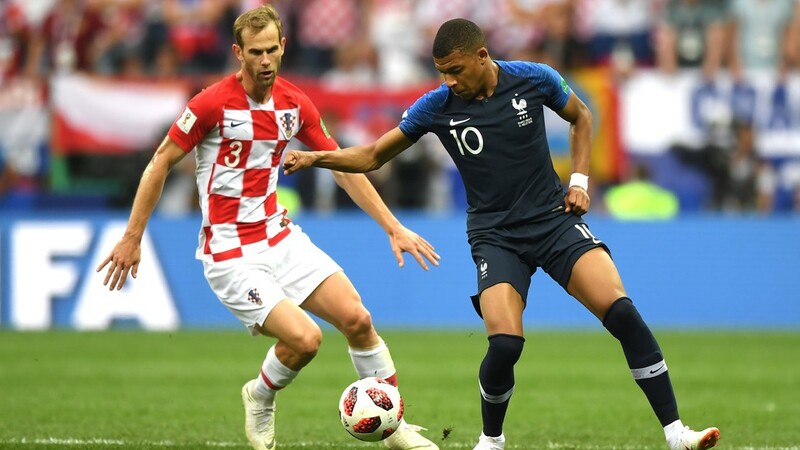 Ivan Strinic of Croatia and Kylian Mbappe of France battle for the ball during the 2018 FIFA World Cup Final between France and Croatia at Luzhniki Stadium on July 15, 2018 in Moscow, Russia. 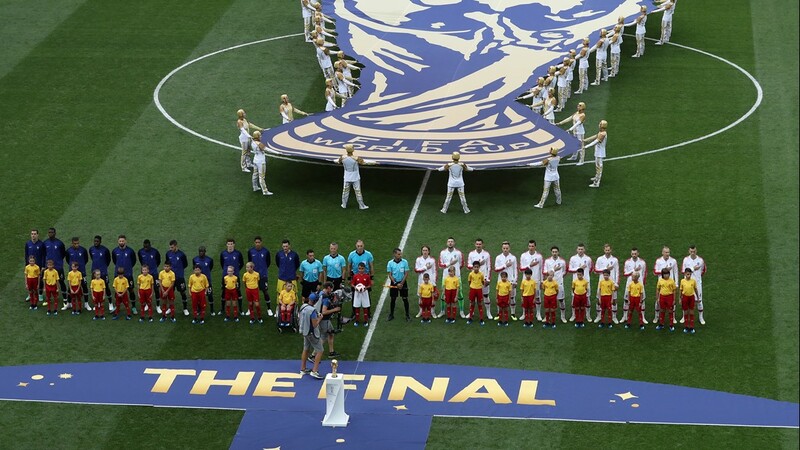 The France and Croatia teams line up prior to the 2018 FIFA World Cup Final between France and Croatia at Luzhniki Stadium on July 15, 2018 in Moscow, Russia. 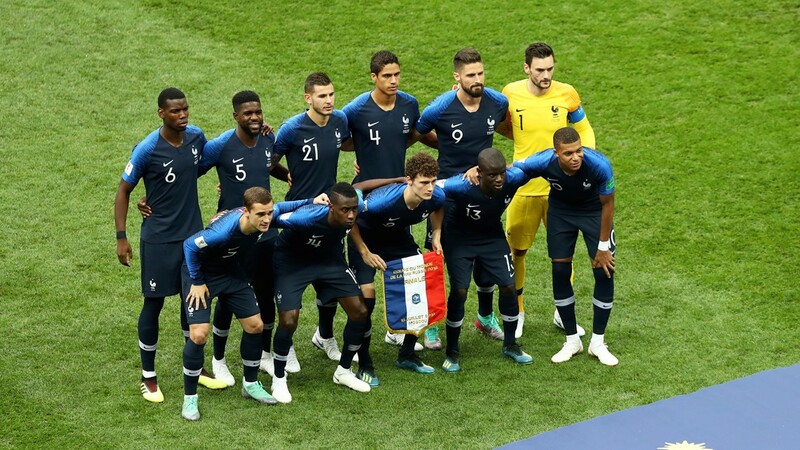 France players pose for a team photo prior to the 2018 FIFA World Cup Final between France and Croatia at Luzhniki Stadium on July 15, 2018 in Moscow, Russia. 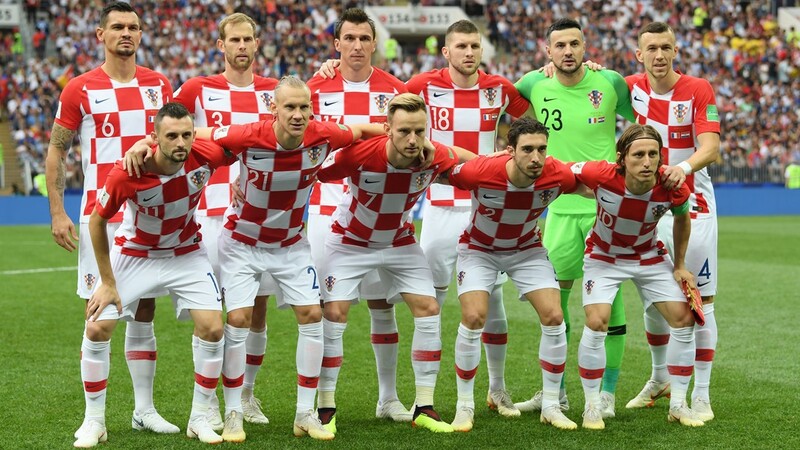 The Croatia players pose for a team photo prior to the 2018 FIFA World Cup Final between France and Croatia at Luzhniki Stadium on July 15, 2018 in Moscow, Russia. 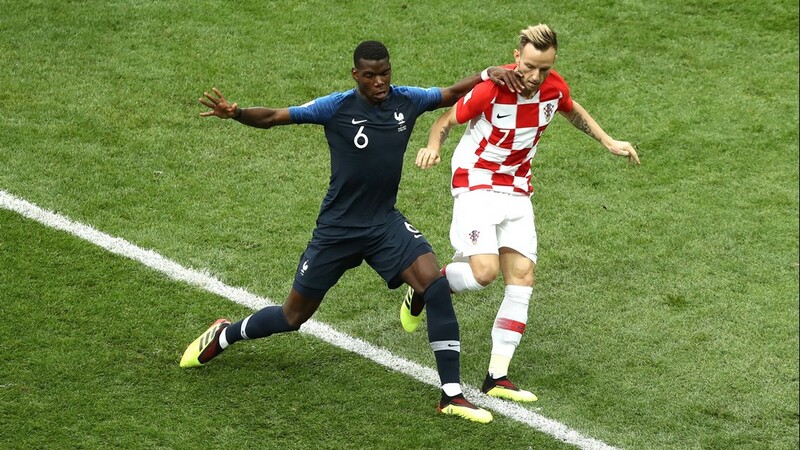 Paul Pogba of France tackles Ivan Rakitic of Croatia during the 2018 FIFA World Cup Final between France and Croatia at Luzhniki Stadium on July 15, 2018 in Moscow, Russia. 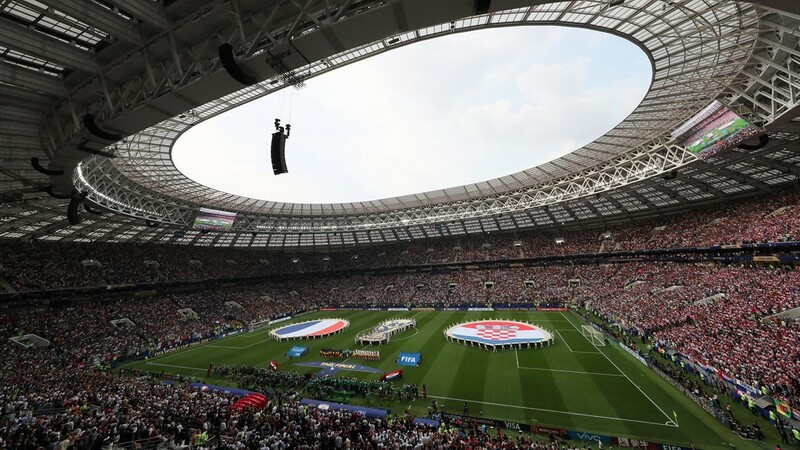 General view inside the stadium as the France and Croatia teams line up prior to the 2018 FIFA World Cup Final between France and Croatia at Luzhniki Stadium on July 15, 2018 in Moscow, Russia.